​A lot of people get overwhelmed when buying an air soft rifle for shooting practice. The truth is numerous brands are engaged in providing a wide variety of airsoft weapons to suit the needs of different types of shooters. Consequently, choosing an ideal weapon that matches your shooting traits and preferences becomes really difficult. However, you may get away with this herculean chore by assessing top-rated airsoft rifles offered by popular brands. One such highly recommended weapon is Well L96 AWP Black Bolt Action Sniper Rifle Kit with Folding Stock Bipod and 3-9x Scope. Check out the features and pros of this iconic sniper and ascertain how this sniper can enhance your shooting capabilities. ​WELL presents a superbly crafted L96 AWP to the world of airsoft sniping. Based on an original design, the L96 utilizes the classy L96 trigger box which can be easily upgraded and maintained. The folding stock allows you to easily transport the rifle from one place to another. The rifle measures about 37 inches in the folded position and 45.5 inches in the extended position. With a shooting velocity of 470-480 FPS, the L96 fires quickly at your targets. The drop-free magazine contains 24 BBs, allowing you to shoot various targets in rapid successions without requiring any reload. The package includes a sniper rifle, magazine, power scope with scope rings, folding stock bipod, sling, and manual. ​Design - The L96 AWP comes with an alluring design that gives the illusion of a real weapon. The speed loader, the power scope, and the Tri-rail mounting block all adds to the look and feel of the rifle. Besides the intriguing visuals, the rifle features a well-crafted design that lets you shoot like a pro. ​Grip - The L96 has an ergonomic grip that allows shooters of all levels to take accurate shots. The perfect blend of the ergonomic thumb-hold style stock along with an adjustable monopod gives stability when shooting. As such, users are in a position to shoot their targets effortlessly. ​Comfort - The L96 AWP slides conveniently in the hands of users. Whether you're lifting the rifle for the first time or have enough experience in shooting, the weapon renders the desired comfort level to all types of shooters. Consequently, taking accurate, error-free shots becomes easy and hassle-free all the time. ​Safety - Shooting invites injuries, and it's okay to sustain minor injuries. However, major injuries should be averted at any cost. Some major injuries can be demanding and keep you from the shooting field. 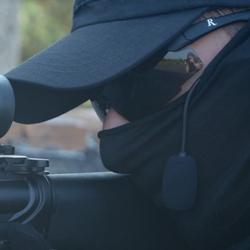 The L96 AWP comes with advanced safety functionality. This, in turn, ensures safety and avoids possible injuries. Quality - The rifle is a replica of an original weapon. As such, it's designed to be of good-quality. The body, the construction, the built as well as the additions are well-made. Whether you want to use it as a display piece or practice weapon, the rifle presents quality in all respects. ​Durability - The Well L96 AWP is a highly durable weapon meant for regular usage. Whether you love shooting in the backyard or intend to become a hunter, this sniper will let you accomplish your desires without wearing out. All you should do is use the rifle carefully in order to enjoy the companionship of this iconic weapon for a long time. ​Upkeep - Cleaning and maintaining an air soft rifle can be a task. Aside from shelling out money, you've to invest time on the upkeep of the weapon. Failing to do so can damage the gun. If this happens, you'll have to buy another rifle. As well as costing you money, switching to another rifle will only hamper your shooting tenure. You should buy a rifle such as the Well L96 AWP that requires low maintenance. With little care and upkeep, you can easily maintain the rifle in good condition for a long time. ​Price - Pricing plays a pivotal role in any purchase decision. In fact, a high price can keep any buyer from buying a highly-rated rifle. To avert any such scene, the Well L96 AWP is priced in the most economical range. Consequently, even people with a very low budget are able to use this weapon for shooting. ​Ease of usage - Using the Well L96 AWP is easy. You don't need to be a professional shooter to use this sophisticated weapon. Even an amateur can practice shooting in his backyard with this sniper. In case you face any difficulty with respect to the usage, you can go through the user manual and resolve your worries quickly. ​Warranty - The Well L96 AWP is backed by a 30-day warranty. You can get in touch with the vendor within these 30 days for a number of issues. For example, the warranty period covers repairs and servicing of the rifle. Additionally, you may seek a refund or replacement in case the weapon arrives in bad condition. ​Many people get carried after buying the Well L96 AWP and assume that they can shoot like a pro within a day or two. Most of these enthusiasts fail to take effective shots and blame the gun for poor performance due to usage issues. However, you can't become a proficient shooter in a short-time. You ought to shed some sweat in the backyard or field in order to get used to with this innovative rifle. Once you get handy with the rifle, taking shots will be easy. ​Many folks get confused when buying a good-quality airsoft rifle, thanks to the existence of so many weapons out there. While each weapon claims to be the best, most of them aren't worth their claims. You need a gun that will live up to your shooting expectations and budget. This is where the Well L96 AWP Black Bolt Action Sniper Rifle Kit with Folding Stock Bipod and 3-9x Scope comes in handy. Take a look at the varied features and pros of this high-quality rifle. Within no time, you could conclude why this sophisticated sniper is the best selection for shooting practice. Proud blue collar American, father and airsoft enthusiast. Have been enjoying Airsoft for the past 10 years and happy to share my thoughts on all the different options for snipers out there.